"The creation of something new is not accomplished by the intellect but by the play instinct acting from inner necessity." My name is Steve Raskin. I have created music in many styles for a wide variety of film and television projects including documentary, TV and feature films, series television, themes for CNN, corporate videos and nationally-aired spots. I invite you to listen to my music. 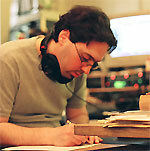 If I can be of service to your project - as composer, sound editor, mixer or music supervisor - please contact me.